Paris! It’s the city of love – so long as you stick to the neat gardens of Le Marais, plant your fingers in your ears and sing Clair de lune at the top of your voice. On the other side of the river, the mob tip carriages back and forth until their passengers spill out onto the cobbles. An assassin, as ever, lives in the space between. Here’s everything Ubisoft have told us about the diverse districts of Assassin’s Creed Unity’s open world thus far. 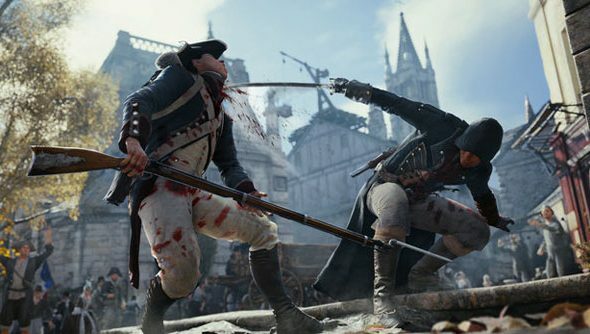 Ubisoft promise we’ll see “every horrible and wonderful thing” going on in 18th century Paris. On one beautifully pedicured hand, we have Le Marais – once the HQ of France’s religious institutions, by 1989 the location of the city’s most parkour-friendly mansions. A short piece of flavour text on Ubisoft’s elaborate site describes an assassin weaving through exquisite gardens, “pretending to admire the blossoming flowers and green leaves”. Trailing missions are still in, then. The city’s plight lives mainly in Ventre de Paris – a “teeming mass of angry humanity” looking for scapegoats. Ubisoft point out that over 1,100,000 French citizens were officially beggars by the start of the Revolution, and here’s where we’ll find many of them. Assassin’s Creed players are used to navigating entirely hostile environments, but it sounds like we’ll find assistance in the furious masses. 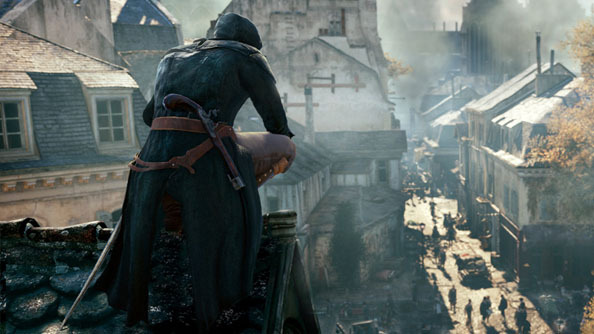 Ubisoft describe men competing to grab Arno’s target, ensuring they won’t get away. The sense is that the player will be silent witness to unspeakable wrongs in Assassin’s Creed Unity. Success will mean letting some of them happen. Île de la Cité, finally, is the island on the Seine at the centre of Paris. That’s where we’ll find the guillotine featured in Assassin’s Creed Unity’s E3 footage – and the Notre Dame waiting to be scaled. Socially and architecturally, it seems Unity’s going to be a lot like playing Dishonored. That okay with you?